We are lucky to live in a city of murals, and extra lucky to go to school down the street from this awesome corridor of buildings reimagined by Dutch painting team Haas and Hahn. We studied Haas and Hahn's work around the world - identifying shapes and colors they tend to use in their work. "Why would communities want to paint their whole neighborhood?" 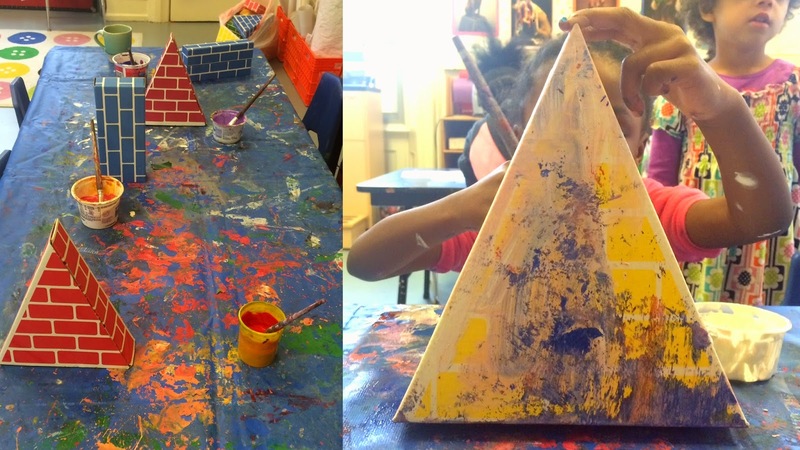 Then the kids followed in their footsteps, changing these boring old blocks to works of art using paint and colored tape. Unlike many of our projects (which result in a take-home, individual artwork), this endeavor had a focus on collaboration - from planning, to painting, to building different structures, like houses, towers, and banks(? ).